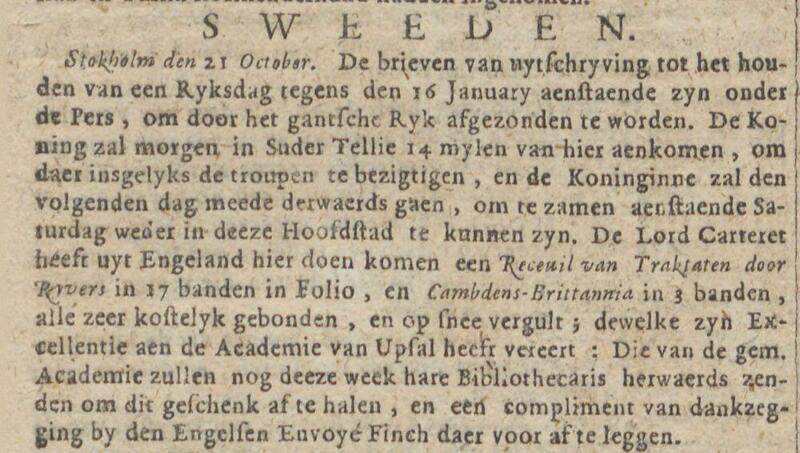 A report in the Amsterdamsche Courant of 5 November 1722 mentions a donation of books by the English Lord Carteret to the Academy of Uppsala. The question that first comes to mind is whether these books can still be traced in the collections of the University Library today. Is there material evidence of the donation from three centuries ago? Let’s start with the report in the Amsterdamsche Courant. Halfway the article, dated 21 October, it says that Lord Carteret brought in from England a ‘collection of treaties’ (receuil van tracktaten) by Reyvers in 17 folio volumes and Cambden’s Brittania in 3 volumes, all costly bound and with all edges gilt. The librarian of the Academy of Uppsala – presumably Erik Benzelius the younger – would collect them later that week and express his gratitude to the English envoy Finch. Just to show how news networks function: the Oprechte Haerlemsche Courant of the same date has the same story, while the Freeholder’s journal issued in Londen on 7 November also mentions the donation. 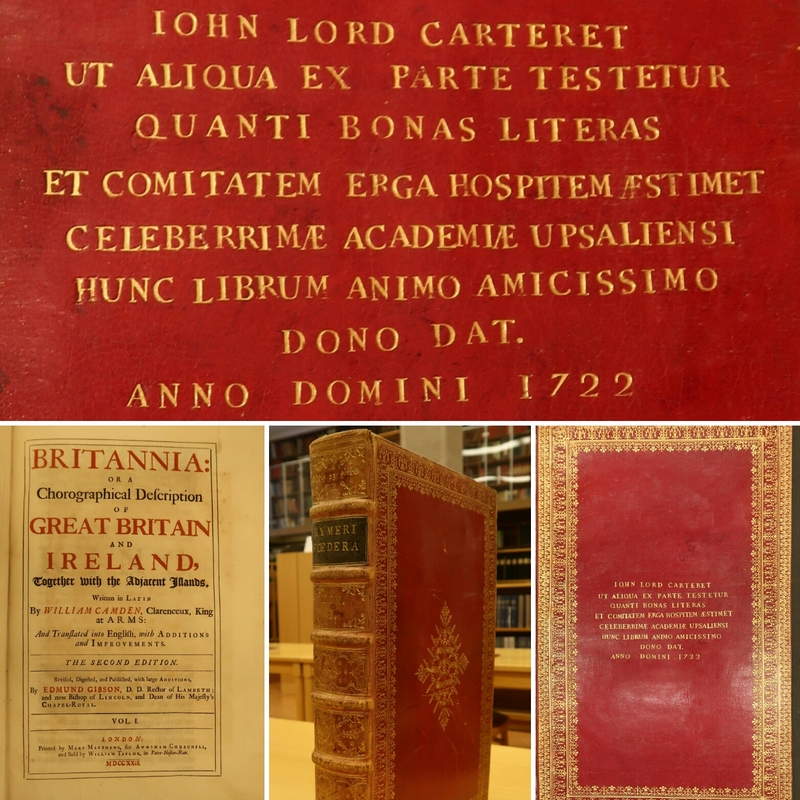 It is not stated why Lord Carteret gave the books to Uppsala, probably because everybody at the time knew that John Carteret, 2nd Earl Granville (1690-1763) had a brief but respected career in the north. Carteret served as an ambassador to Sweden in 1719 and 1720. It was his first public office in foreign policy and not an easy task to start with. In the final stages of the Great Nordic War, Carteret had to convince the Swedish senate and Queen Ulrika Eleonora to accept territorial losses in return for monetary aid and a renewed Anglo-Swedish alliance. According to contemporaries he showed great tact in dealing with the interests of the Swedes, Frederik IV of Denmark and King Friedrich Wilhelm I of Prussia, while also keeping an eye on the Russians. Sweden respected Lord Carteret and the donation shows that the respect was mutual. So where are these books now? 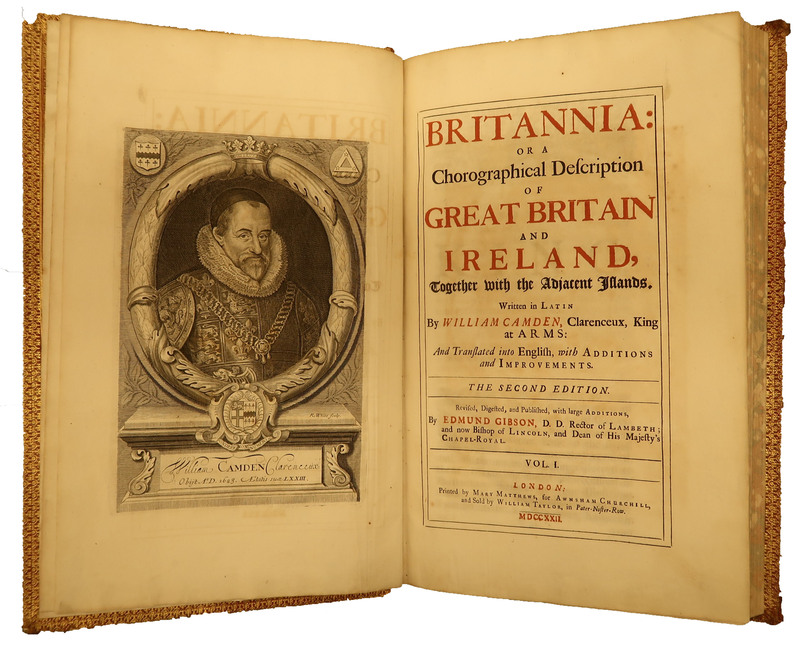 The second title mentioned in the newspaper can easily be identified as William Camden’s Britannia, the first chorographical survey of the islands of Great Britain and Ireland. Originally published in Latin in 1586, the work was instantly recognized as a scholarly masterpiece. 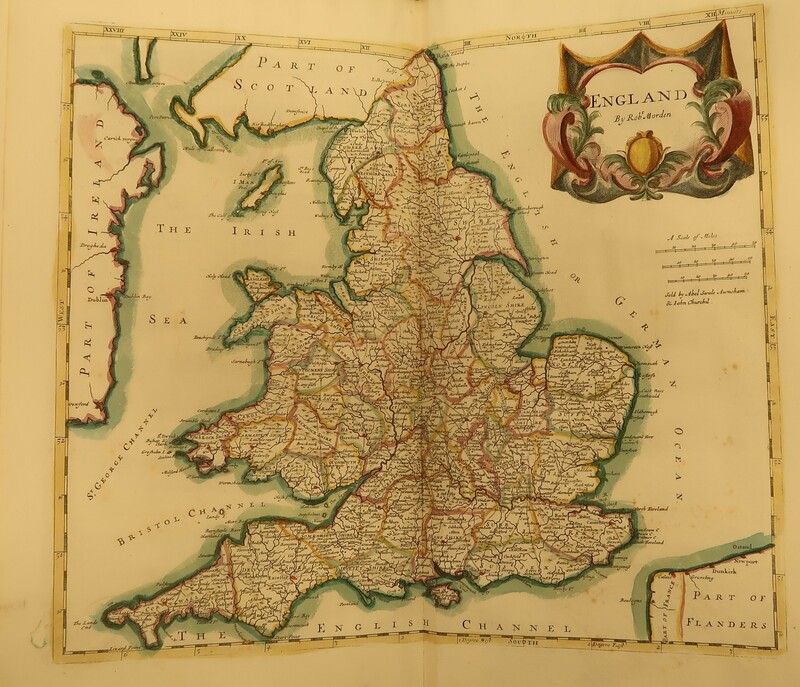 Britannia was reprinted several times, the first English translation dates from 1610, and versions of the text were also included in Joan Blaeu’s Theatrum Orbis Terrarum and in Johannes Janssonius’ Novus Atlas. Title-page of Camden’s Britannia, edition 1722. Source: Uppsala University Library. The copy in Uppsala University Library is an English language edition from 1722, all be it in two volumes (as published) and not in three as is stated in the newspaper. The bindings are exquisite, the edges are gilt and the maps are nicely colored. On the inside of the boards is a gilded letterpress text stating that Lord Carteret donated these books to Uppsala University to show his gratitude. Binding and dedicatory text on Camden’s Britannia and Rymer’s Foedera. Source: Uppsala University Library. The other title mentioned in the newspaper is not easily identified. The name of the English compiler of the work was apparently lost in translation. Reyvers from the article in the Amsterdamsche Courant should in fact be historian Thomas Rymer (c. 1643-1713). He is best remembered for his Foedera, a collection of treaties concluded between England an foreign powers. The first seventeen volumes were published between 1704 and 1717, three additional volumes were published in 1726, 1732 and 1735. The seventeen volumes that are now at Uppsala University Library have similar bindings to Britannia, again with the dedication by Lord Carteret on the inner boards. What can we learn from this, apart from the fact that Uppsala University Library takes good care of donations? First and foremost, that there is a transnational story to be told that involves digital collections (in this case newspapers), physical copies and material evidence in three different countries. In special cases, it is absolutely possible to link titles mentioned in an article centuries ago with copies in the stacks of a library today. The catch is, however, that names and figures mentioned in a newspaper should be approached with great care and need interpretation. It is hard to tell if contemporaries would have guessed that Reyvers was Rymer, but it took me a few days and the help of a handful of colleagues to crack this puzzle. Furthermore, the title of one of the works is not given in the newspaper article, while the other one could have referred to any edition of the work from 1586 to 1722. Moreover, the number of volumes given for Britannia is not correct. Information from a variety of sources can provide answers, but only if material evidence is recorded in a structured way. If we would simply scan the newspapers, catalogue the books in a basic way and rely on linked data to do the magic, there would not have been a match in a million years. Map of England in Camden’s Britannia. Source: Uppsala University Library.